Securing your load is important. In April 2015 an accident with injuries occurred in Miami-Dade Florida where a tractor trailer lost control and crossed the median into oncoming traffic. The 18 wheeler was trying to avoid a wheel barrow that had fallen out of a pickup truck. 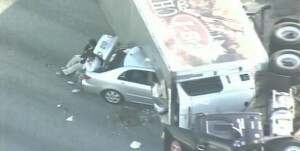 Six vehicles in addition to the tractor trailer were involved in the accident. The pickup truck was traveling northbound on the Turnpike with an unsecured load according to a state trooper. Two people were critically injured in this accident. One woman had to be cut out of her van with the Jaws of Life. Traffic was shut down for four hours to clean up the accident. Highway state trooper stated that an arrest is likely. They will track the pickup truck through traffic cameras and locate the driver. The consequences of an unsecured load can be devastating. The injuries, vehicle damage, road closures and a possible arrest could have been avoided if the pickup driver had taken a few minutes to properly secure his load. Right!! While loading your vehicle, Security and Safety is very important. To overcome this type of danger we should use the cargo net, that are available in the market for every type of vehicle like car, truck and SUV. With the help of cargo net we can organize our vehicle properly and cargo nets are very easy to install.